Next up for England is Bosnia-Herzegovina on Tuesday. Can they get their qualifying campaign back on track? That's it from us. Until next time, cheerio. England goalscorer Jill Scott: "We'll look at it as two points lost but we will take the positives from the second half. We created a lot of chances, we know we can play a lot better. "We have a great group of players. We are one team, we win together and lose together." A much better night for Scotland as they breezed to a 3-1 win at home to Slovenia. They are top of Group 1 and well on course to securing a place at Euro 2017 in the Netherlands. England forward Eni Aluko: "It is a disappointing result. We were confident going into the game that we could win it but Belgium were tough to break down. Fortunately Jill Scott got the goal, we pushed at the end but it wasn't to be. "Belgium did well to congest the pitch. They frustrated our play, we were not as precise as we have been in the past. We will learn from this game and figure out how to break teams down and get wins." 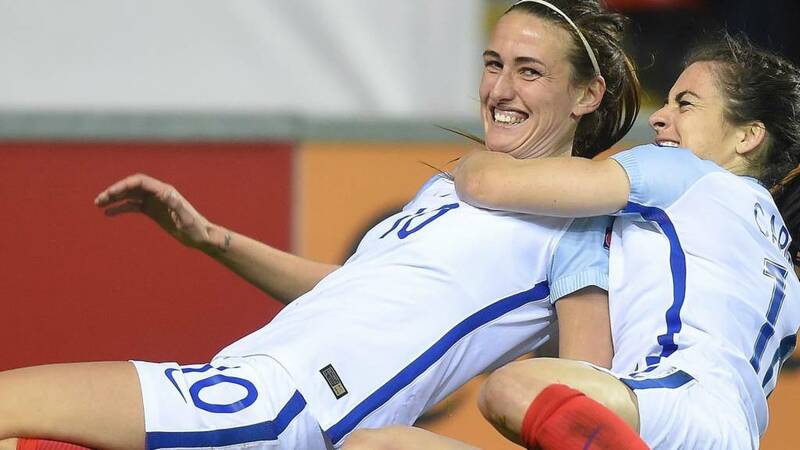 England manager Mark Sampson: "We wanted to win so it is a disappointing result for us. Credit to Belgium. They were well organised, physical and showed great character. We came back from a strange goal to get an equaliser and unfortunate not to win it in the end. "On another night we could have scored five or six but we just didn't execute our final ball. Still have faith in Karen Bardsley after her error? "Change Karen Bardsley? No chance. She has been outstanding for this team. She is a superb goalkeeper. She has bailed us out many times, we'll give her that one and she will be back for Tuesday." Former England forward Kelly Smith: "The first half performance was disappointing but the second half was more positive, more confident, on the front more and the substitutions made a difference. Credit to Belgium, they stifled England today." Here's how the table looks after that draw. Belgium are a point clear of England. Only the side top of the group automatically goes through to Euro 2017. All over and Belgium celebrate a big point. England look disheartened. This was a game they really should have won. Another change for the visitors as they look to eat up a few more seconds. Is there time for one last attack? Belgium's Maud Coutereels is shown the yellow card for protesting a free-kick for England. Steph Houghton takes the set-piece, lifting it over the ball and it has a bit of a sting to it as Justien Odeurs has to gather at the second attempt. Belgium want the draw and they make a substitution, slowly. Tine de Caigny jogs off with Sara Yuceil replacing her. Up goes the fourth official's board. Five added minutes. Karen Carney's dangerous cross is headed behind. It is just wave after wave of attacks. England are knocking on the door..
Eni Aluko's cross is stabbed away as England come forward. Then, Fara Williams' cross from deep is thumped behind by Justien Odeurs. England are going for it. Now can England go and get a winner? That goal has lifted the crowd and England are responding. There is a bit more energy about them while Belgium look visibly deflated. My word it seemed like an England goal would never come but finally they breach the Belgium defence. Alex Scott lifts a cross into the area, Karen Carney heads down and Jill Scott stabs in from close range. Scott to the rescue once again. Belgium fail to clear a corner and Steph Houghton almost takes full advantage as she sweeps a shot from just outside the area inches wide of the upright. Casey Stoney is not someone you get to see celebrating scoring often. She has just six in 127 games but she isn't far off a seventh as she gets a touch to a cross, but not enough to trouble the Belgium keeper. Final change for England as Katie Chapman is replaced by forward Gemma Davison. England are going for it. They need to as time is running out.